• DREADED the long haul from the market to your car door? • STRUGGLED every time to hold onto your keys, hold the elevator door and load/unload your grocery bags? • EXPERIENCED pain from heavy bags digging into your hands? • HAD TO make repeat trips to and from your car? • AVOIDED buying as many groceries as you'd like because carrying the bags is such a hassle? • EASILY COLLAPSES to a convenient carry and store size - opens in three easy steps. • LESS STRAIN and easy to use when expanded. • GREATER CAPACITY achieved by suspending bags. • NO DAMAGED GOODS caused from stacking bags on top of one another. 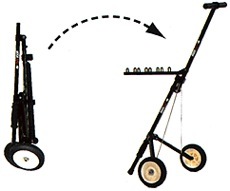 • NO BENDING DOWN to pull or push - easy to maneuver through elevators, hallways, and doors.